Welcome to the Spectrum-part of this site. The Spectrum hosts more Miner Willy games than any other system in the galaxy (The Amiga being a good (but not close) number two), and therefore there's futher links to the authors' pages, making it easier for you to sort them out. Many of these have reviews too. Also vistit Andrew Broad's excellent list of Manic Miner and Jet Set Willy games. Description: Andre the cook has waltzed off for the evening without leaving so much as a boiled egg for Willy to munch on! Our hero marches down to the kitchen to make himself a sandwich and comes face to face with the amazing technicolour man-eating pizzas! (The best of two availiable plots...) The goal is to stay alive as long as possible. 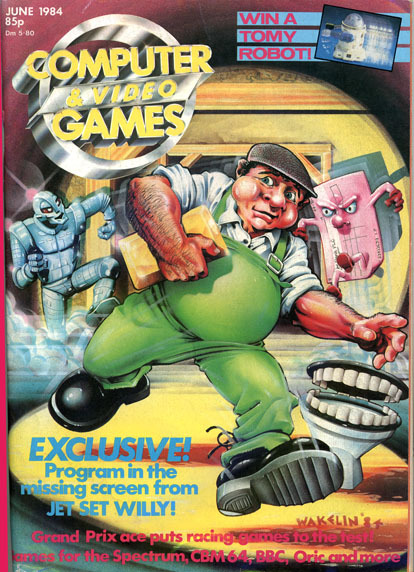 Possibly the best game starring Miner Willy, ever! Recommended! The story ... "Our Hero returns (again) to his mansion after one of his many adventures - but only to find that most of it has changed, or seems to be falling down! On further investigation Willy realises that something has been using his house for their own evil deeds. Maria seems to be in hiding somewhere down below, and strange lights have been spotted in the night sky... maybe it's the builders, maybe it's something else..."
Comments and hints written by Gawp. For more information and screen shots, click here.
?" he thought. "Why am I in the bathroom?" Looking around him, he remembered a comic book he had read once when he was seven "Oh Lord! I'm in a time rift!" Keeping calm, Willy thought what to do "I've got it! That machine I bought from that strange little market seller! That will fix this problem. But how to get it working? The last time I had a party its parts got scattered all over the house, and I'm really not in the mood for MORE running around picking up little bits of stuff. Especially while I've still got all those weird whatchamacallits running around in my house. Oh why did I let that scraggly looking pot head Matthew help plan my house? Well, I guess I've got no choice, I must get out of this time rift and get those bits before the rift consumes everything." Well, you heard the man. Off you go.
) Apart from the Finrfghootoagoosnblayld-traps, the game is great. How I'm supposed to get past the "Loose Viral Swarm" without cheating, beats me, but I always did want to see "Willy's Trainset" and there's finally some originality added to the unavoidable "Red Room" (This time done in a more "Shining" way). VERDICT: NICEONEYEAH! Description: James McKay has done a special version of JSW2 that disables collision detection for three seconds after you're hit. (thus avoiding loosing all your lives being continously teleported on top of the same bad-guy...). The Speccy 128 version also includes a cheat menu when you press 't'. Thanks to Carl Murray for asking James McKay to do these fixes, and for passing them on.